Four scrappy hunters versus one super powered beast. It’s a conceit with immediate appeal, one that 2K and developer Turtle Rock have milked to great effect in the months leading up to Evolve’s release. The perpetuation of hunting as a pastime is in itself a validation of the design philosophy of the game; the thrill of the hunt is one that has scarcely been captured in video games before, much less in the hairtrigger realm of the multiplayer shooter. However, a hunt is only as thrilling as its prey and therein lies the big question: Is the balance there? Can one monster truly hope to defeat four hunters? The quick answer is no. So many concessions have been made for the hunters, so many benefits stacked in their favor, that you’ll scarcely see the monster win online. Personally, I came to loathe playing any of the three beasts; what had at one point been a major selling point of Evolve all too often became a justification to put the controller down. And it wasn’t just me that seemed to take issue with the monsters. When I was a hunter, I found that victories often came fast and easy, even when monsters were playing tactfully, sneaking through the environments, and powering up. And even though I put the monster class all the way at the back of my preferences list - indicating that I would rather play any class in the game than the monster - I oftentimes found myself thrust into the role against my will, a fact which indicates either that the preferences system is hopelessly broken, or that almost nobody has fun playing as a monster. There is a laundry list of reasons that Evolve is ultimately unbalanced, but in order to best understand them, you must first understand the core conceit of the game. Yes, I’ve mentioned four hunters tracking one monster. But the core of Evolve is much more complex than that, and it is this complexity that occasionally redeems the game when it stumbles. See, each of the four hunters plays as a different class. In every hunt, you’ll have an Assault, a Tracker, a Medic, and a Support character in your party. Each class has three characters, each with different weapons and abilities. For example, Markov is the first Assault character you’ll play, and he comes equipped with a shield, an assault rifle, a lightning gun, and mines. Once you earn enough experience with Markov, you’ll unlock Hyde, the second Assault character. He also has a shield, but instead of an assault rifle, he wields a flamethrower, and he has a chaingun and toxic grenades instead of a lightning gun and mines. The fact that there are so many permutations on each class gives Evolve a lot of value for those interested in mastering each style of gameplay. The Assault class requires its own playstyle in comparison to the Medic, the Trapper, and the Support, but even within the Assault class, each character demands a slightly different approach. Although the game lacks the weapon unlocks and character upgrades present in most online shooters, I found Evolve’s class progression to be enough motivation to keep playing. The monster has a similar progression line. You’ll begin as the brutish Goliath, a slow beefhead of a beast whose main abilities include a rock throw, flame breath, a scattering charge, and a damaging leap. Damage enough hunters with each of these abilities, and you will next unlock the Kraken. The Kraken is a much more interesting character than the Goliath, in that it can fly, spew out electric beams, and take hunters out from a distance. Master the Kraken, and you will unlock the most frightening of all the monsters - the Wraith. This beast was clearly inspired by creature films, as its stealthy abilities and deadly claws allow it to take out lingering hunters. What makes the monsters unique from the hunters, aside from the third-person perspective from which they are played, is their ability to evolve by chowing down on wildlife. There are lesser beasts scattered about each of Evolve’s levels, and killing and eating them will allow you to power up your beastie from level one all the way up to level three. Each successive level you gain gives you more health, and more points to dump into your four skills. The monsters have two different health bars. The armor bar protects the monster’s primary health bar, and can be replenished by eating lesser wildlife. The primary health bar drains much more slowly, but can never be replenished. The design itself isn’t broken, but its implementation nearly is. In order to take down four human-controlled hunters all working together, the monsters would have to be titans, armor-clad, fearsome foes. Even the Goliath, which is supposedly the strongest of the three monsters, cannot face a group of hunters in open combat effectively. The armor bar for the monsters drains very quickly - especially strange given that the armor provided by the Support’s armor beam and the Assault’s shield is literally invulnerable - and if you find yourself under any amount of concentrated fire, you will surely take health damage. This means that you must pick and choose your battles as a monster, which again is fine, but the game isn’t balanced very well for this mode of play either. As a monster, if you don’t sneak through the environments, you will scare up birds which will give your position away to the hunters. The hunters get a fairly good idea of where you’re going thanks to the Tracker, who can project glowing footprints for the team showing where the monster has been, but with birds giving away your exact location every few minutes, it’s best to sneak through the environments. However, this will deliver a significant hit to your speed, so you’ll have to pick and choose between staying hidden and being overrun, or making a run for it and being tracked. The hunters are faster than most of the monsters thanks to their jetpacks, so it’s generally best to remain hidden as long as you can. If Evolve was simply a deathmatch, clever monster players might be able to hide in the forest, picking off hunters one by one until the match ended. However, there are a series of other objectives that put the monster at a natural disadvantage. The hunters can win by either killing the monster, or by draining the match timer to zero. The monster, on the other hand, wins by either killing all of the hunters, or by destroying a generator on the map. The generator can only be breached once the monster reaches level three, but even so, this asymmetry in objectives means that it’s easy for the hunters to know where the monster will end up, which defeats the purpose of a hunt in the first place. I’ve seen hunters break off from the chase when I hit level two, only to retreat to their generator, surround it with mines and traps, and wait out the rest of the match. And why not? Because the monster loses when the timer runs out, he is forced to charge headlong into what will almost assuredly be a trap. This makes things boring from the hunter perspective, too. I’ve had a few matches where the whole team retreated back to the generator, surrounded it with traps, and then stood there idly waiting for the monster to show up. A number of other choices serve to frustrate. Hunters respawn every few minutes via a dropship, for example, so as the monster, if you don’t take out the entire team almost immediately, you’ll have to do it all over again. The dropship timer isn’t relative to when the players died, so there were times where I killed a group of hunters only to have them respawn less than five seconds later. It’s hard enough just to kill a hunter in the first place, though, because they have so many ways of reviving one another once they are downed. You can run up and do the classic revive, which puts you in danger, but why bother with that when the AI-controlled Daisy can also revive players? The Medic’s healing beam can revive downed players from a distance, while the Support’s cloaking blast sends out an area-of-effect pulse that - you guessed it - also revives downed players. Meanwhile, the monster doesn’t even have a way to regain health, and even a full armor bar can be depleted in a matter of seconds. That’s not good when the monsters make for such large targets on comparatively cramped maps. 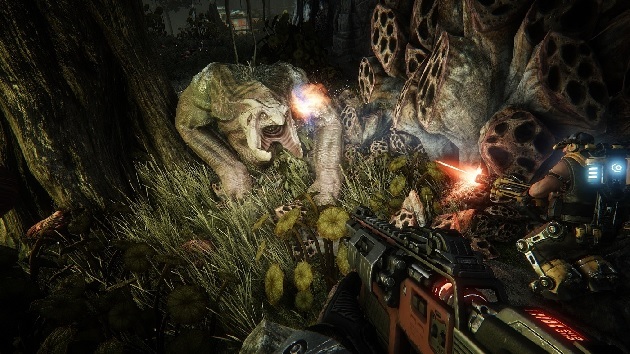 The balance issues carry over into Evolve’s second mode, Evacuation, where they actually become a focal point of the gameplay. Brilliant in concept, each session of Evacuation strings together five separate matches, each with varying objectives. The first round is always the standard Hunt mode and the last round is always a base defense mission, but the matches in between might have you attacking eggs as hunters while the monster attempts to hatch them into minions, or rescuing survivors while the monster races to eat them. Though there are only a handful of these variations, they serve to add much-needed variety to the moment-to-moment gameplay, and it was this variety that ultimately made Evacuation my favorite way to play. However, Evacuation is also host to drastic swings in balance, the result of an auto-balancing system that changes play conditions between each match. That’s a sound concept, but the crazy thing is that the game will actually balance the odds against the loser every time, serving only to further increase the winner’s chances in the next rounds. Lose one match as a monster, for example, and the game might add an orbital laser strike that periodically hits you from space during the next match. Lose a match as a hunter, and the monster might have AI-controlled minions in the next match. It’s an absurd implementation of a sound idea, and one that is evocative of the lack of thought that went into properly balancing the game. Between this and the natural disadvantage of playing as a monster, you’ll rarely see the beasts win many rounds in this mode. I’m not suggesting that it’s impossible to win as a monster. I’ve won a few matches with each of the creatures, as I had to do in order to unlock all of them, and so have many others. Those victories were incredibly satisfying, not because I used my cunning and my skill to win, but because I was able to overcome incredible odds that had been stacked against me from the beginning. Losers get little in the way of experience or unlocks to cushion their pride. If anything, Evolve salts the wound further, denying you the experience you need to level up. The majority of experience you’ll get in a given match comes from a “Victory Bonus”, so if you lose, you’ll be stuck at the same level until you start racking up some wins. A number of interface gripes also soured me on Evolve. As a monster, it can be difficult to tell one hunter class from the others. You’re so much bigger than the hunters that their distinctive silhouettes all kind of blur into mush, and the game opts to put a player’s GamerTag over the silhouettes instead of their class. This means that the only way to tell who is who as a monster is to learn the various abilities of the hunters, and then recognize them as they pop off in the battlefield. Meanwhile, as a hunter, it can be hard to tell if your shots are connecting from a distance because the game lacks a hit icon like Call of Duty, Battlefield, and most other major shooters have implemented. Finally, even at launch it seemed difficult to find a full game. I was typically dropped into three-person games, with AI filling in the other roles until humans eventually took their places. I’m not sure if that’s indicative of poor matchmaking, or if there just aren’t a lot of people playing. For as much as I disliked about Evolve, there’s clearly the skeleton of a great game living beneath all the poor balancing choices. Each class is totally unique, and while you don’t have a choice of which class to play match to match, there is great satisfaction in learning how to play each of the hunters. Even as the game’s issues began to present themselves, I could see myself becoming invested in unlocking each hunter character. It helps that the shooting is tight and the weapons and gadgets satisfying. While Evolve might stumble in making the monster feel formidable, it excels at giving the hunters plenty of neat tools to play around with. Each hunter has a jetpack that allows them to scale vertical inclines and dash back and forth. They also each come equipped with four abilities, mapped to the face buttons. In Evolve, weapons are treated as abilities, so instead of pressing Y to switch between Markov’s assault rifle and lighting gun, you’ll press Y to switch to one, and B to switch to the other. It feels odd at first, but it quickly becomes second nature. So too does the game’s auto-sprint, a smart feature that automatically makes your character start sprinting after a few steps. No more clicking and re-clicking the left stick like in other shooters. All in all, mastering the game’s hunter classes is a fun and rewarding process that encourages you to keep pushing towards mastery. The world itself is another asset in Evolve’s corner. Whether you’re playing in a dark and stormy forest or a bleak, arid desert, Evolve’s world is one that’s practically begging to be explored in more depth. The team at Turtle Rock have crafted an entire ecosystem for the hostile planet Shear, ranging from tiny bugs to massive predators big enough to give the monster a run for its money at lower levels. The most devious of all the creatures on Shear isn’t the monster, but rather the large, rock-like Megamouth, a devious beast that disguises itself as a rock until unsuspecting hunters venture near. I’d love to see the world of Evolve explored in further multiplayer modes, or even a campaign. As is, Evolve feels like a window peering into an incredible and imaginative world, but one that is only half-cracked. I’d be remiss to mention Evolve’s environments without also touching on the game’s visuals. Even this late in the current generation, it’s rare to find a game with graphics that look like they couldn’t have been done on a PlayStation 3. Evolve is one of those games, gorgeous, moody, and full of life. It’s a real visual showpiece. Beautiful as Evolve is, looks alone can’t make a game. The skeleton of a better game is visible just beneath the surface, but numerous glaring imbalances and questionable design choices ensure that there’s sadly little meat left on these bones. The thrill of the hunt is mitigated in the best of matches, and rendered altogether pointless in the worst. It’s a sad fate for such a promising game, but perhaps the franchise can itself evolve in future iterations. Until then, I’d take a pass. Halo 5: Guardians obviously isn’t meant to be played for its by the numbers campaign. If your love for Halo falls strictly within the realm of its multiplayer, then prepare yourself for a grand old time. Hand of Fate is an unique game that blurs the line between an action RPG and a tabletop collectible card game. I knew I was obsessed with Overwatch when I found an excuse to incorporate it into my job and bought a copy for the PlayStation 4 so I can play with my brother and other friends.